Welcome to Openworld! We invite you to explore new "Seeds of Change" offers for the sustainability of local and global good causes. The offers - consisting of microscholarships, telework opportunities, and toolkits delivered through cell phones and the Internet - aim to help social ventures awaken assets in poor regions. get local decisionmakers to pilot reforms that lift the value of these endowments. Development of local land grants as free zones provides a means to awaken assets for partnering education, health care, and other civil society initiatives. As the initially small demonstration areas scale up to larger zones, countries can generate skills, jobs, investments, and innovations on a success-sharing basis. Openworld is working at present on three tracks to advance new partnerships for growth and sustainability. In a series of presentations and papers, Openworld has mapped ways for transparency-enhancing reforms to awaken human capital and dormant land values for community uplift, as well as for the benefit of global allies contributing to the challenge offers. (click image to view)Market Breakthroughs for the Next Four Billion. In talks for Princeton Microfinance Organization, Free Minds, Templeton Foundation, and Freedomfest symposia and conferences, Openworld has introduced opportunities for global challenge offers to awaken assets in poor areas on a success-sharing basis. The challenge strategy rests on offering microscholarships to entrepreneurial schools and Internet center operators to encourage formation of small, telework-oriented "quickstart" free economic zones. The talks have reviewed how local land values in the zones can rise 5-30 times via partnerships to establish world-class business climates. In cases where initial free zones can scale over time to areas comparable to Singapore, Hong Kong, Songdo or Dubai, billions of dollars in new assets can accrue for education, health care, and other social ventures vested as founding stakeholders. Slides of the talks are available here. A companion white paper, entitled Awakening Assets for the Next Four Billion, is downloadable here. New Catalysts for Sustainability: A Global Opportunity for Digital Philanthropy. 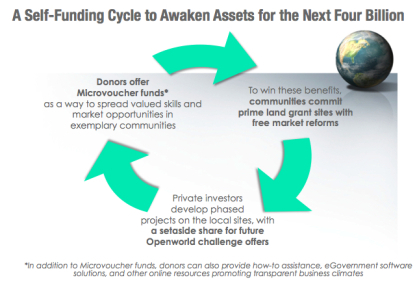 In this white paper, Openworld President Mark Frazier reviews opportunities for microscholarships and other digital challenge grants to spread skills, promote policy reforms, and leverage public land transfers in ways that make social ventures self-funding. A summary of findings from this 11-month Sabre Foundation-sponsored, and Whitehead Foundation-backed, research project is available here. The full 80-page strategy paper -- including an appendix of resources for sustainability -- is also downloadable. *Update* To advance key business climate reforms proposed in the white paper, an Openworld Institute is organizing to promote free and open source eGovernment solutions that will enable communities to make land grants more valuable as lasting endowments for local and global good causes. Market-Based Approaches to Reducing Global Greenhouse Emissions: an African Reforestation Initiative. In a paper for the Congressional International Conservation Caucus, Openworld Chairman Soleman Abdi Idd sets out a sustainable way for international companies to partner with communities in privately funded reforestation areas benefiting from incentives to reduce global greenhouse gases in the atmosphere. The presentation can be accessed here. 21st Century Incentive Systems for Peer Learning. Students at a bootstrap school in rural Sri Lanka offer results of their web research on updating the widely-used 19th Century Lancaster System of rewarding students who teach students. Their work-study project paper is here. *New* Openworld's has introduced a pioneering proposal to engage students as designers/co-owners of for-profit schools, in U.S. and overseas communities where public schools are failing to deliver high quality education. Paths Toward Peace: A Sri Lankan Example for Post-Conflict Societies. This article by Mark Frazier, published by Vision in Action, surveys replicable ways for information technologies to create jobs and improve transparency of business climates in areas recovering from war. The article is also downloadable. the Horizon Lanka Academy in Sri Lanka. Openworld and its partners have helped to fund microscholarships, work-study projects, student creation of eLessons, and a dedicated internet connection for a pioneering private school launched on a volunteer basis in rural in Sri Lanka. The project has attracted diaspora funding for land grant and building endowments to help ensure its future, and gained national media and political support as an example for villages across the country. eCenters and Microscholarship Funds in Kyrgyzstan. With support from the Academy for Educational Development and a $100,000 catalytic microvoucher challenge grant from USAID, Openworld has assisted private telecenter operators in this Central Asian country in extending online learning and certification opportunities at grassroots levels, following local commitment of land grants as endowments for ongoing microscholarship funds. A multimedia presentation on their progress -- with more than 5000 microvoucher recipients over the first 18 months -- can be seen here. Strategy development for Business Parks and eGovernment initiatives in Eastern Europe. In response to the growing interest of municipalities in private sector-led eCenters and Business and Technology Parks, Openworld and its partners have been working with communities to design "quickstart" facilities and development tenders for land grant concessions that offer liberalized business climates. In addition, Openworld has made catalytic offers of microscholarships, work-study projects, and in-kind contributions -- including video cameras, notebook computers, and software -- to local self-help initiatives interested in endowing microvoucher funds and "eAcademies" through land grants in Somaliland, Gabon, and Haiti. Providing digital toolkits in international and local languages for private development of eAcademies, eCenters and Technology Parks around the world on a success-sharing basis with nonprofit organizations. Click for more on tools for global eAcademies , Bulgarian eCenters and Business/Technology Parks, and Krygyz eCenters. Openworld is also interested in assembling open source software teams that will develop turn-key eGovernment solutions for web-based land registries and business climate liberalization, as a means of raising the value of land assets held by local self-help organizations and their regional and global nonprofit partners. Our projects are grounded in the experience of a global team that has worked over the past two decades in more than 60 countries on national and local economic policy liberalization, telecommunications, skills development, telecenter, and business and technology park development projects. We see Openworld's initiatives in coming years leading to creation of "Innovation Parks" and "World Cities" that can replicate the asset-building success of Zonamerica (Uruguay), Freeport (Bahamas), Singapore, and Dubai, in ways that reward early investors and allied good causes. The seeds we are planting for civil society institutions are intended to bring forth nonpolitical solutions that generate new skills, health, and job opportunities for all who seek them, on a self-funding and replicable basis. We welcome your interest and support in helping to open the world. Please leave comments in our guestbook, explore the benefits of becoming an Openworld Sponsor (or donor through a tax-deductible contribution via the Explorers Foundation), and email us with any further ideas on how you can help in spreading new zones of freedom, peace and prosperity.